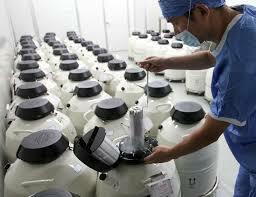 Embryo cryopreservation technology has been used worldwide for over 20 years. Transportation of cryopreserved embryos is relevant to couples who already have a cryopreserved embryo in the IVF country, while the IVF program with a participation of a surrogate mother is planned to be realized in another country, where surrogacy is permitted by law. It is known that the pregnancy rate using cryopreserved embryos is 50-70 %, which is 2-3 times higher than in a fresh embryo transfer. The Surrogacy Center of professor Feskov offers a unique new service of transporting your cryopreserved embryos for surrogacy programs to any country, where surrogacy is permitted. Your cryopreserved embryos in cryounits will be placed in our shipping dewar, which is equipped with a temperature sensor. All temperature variations are controlled by a program manager of the Center for Human Reproduction Clinic of professor Feskov. Dewar is sealed by the customs service of the country, from which the embryos are exported. Technicians of the Embryology Laboratory receive the dewar at the airport. This allows controlling conditions of the first trip of your future children. In the future, your cryopresererved embryos will be transferred into the uterus of a surrogate mother, who has already been examined and prepared for the embryo transfer procedure. The “EmbryoTravel-7” program has become a good practice of our center (highlight to move: more), which includes transportation, defrosting, and transfer of embryos into the uterine cavity of a surrogate mother within 7 days. Couples, in the country of residence of which the surrogacy is prohibited. Save your time: the IVF procedure is performed in your country of residence, and then our courier transports embryos to Ukraine. Save your money: conduct the IVF program to obtain a cryopreserved embryo in your country of residence in those countries where there is a state program for treatment of infertility (reimbursed with your insurance), then our courier transports the cryopreserved embryos to Ukraine for the further transfer of the cryopeserved embryos into the uterus of a surrogate mother. After unsuccessful attempts in other clinics, you can transport your crypreserved embryos for the implementation of the program and have success in the Center for Human Reproduction Clinic of professor Feskov. have a documentary basis for the surrogacy program (a copy of a marriage certificate, copies of passports of both spouses, copies of the previous IVF programs protocols, if any, a copy of the medical conclusion of infertility). We are always ready to answer all your questions and help you to implement a surrogacy program.